Sportaid brings you an ultra-modern collection of Disability Exercisers & Peddlers from the leading brands. 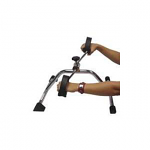 These exercise peddlers stimulate circulation and improve muscle strength. 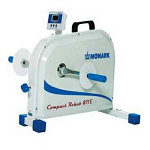 With state of the art equipment from Monark and Saratoga, you are guaranteed the perfect low impact exercises. You can even adjust your equipment according to the exercise therapy prescribed to you. Be the best you can be by choosing Sportaid as your Exercise Equipment supplier. For a complete workout and absolute recovery, browse through our selection of Disability Exercisers or feel free to call 1-800-743-7203 for help in picking the right options for you today. We are here to help! Save 24% on Disability Exercisers & Peddlers at Sportaid! Stay in Shape by Choosing the Right Disability Exercisers & Peddlers from Sportaid.com! Exercise Peddlers, being a safe and gentle form of exercise, are ideal for upper and lower body exercise. Their non-skid foot pads enhance security. Our selection of exercise peddlers includes the Saratoga Colorado Sport Cycle, Saratoga Gold Active/Passive Trainer, and the Pedal Exerciser Upper or Lower Body Workout. 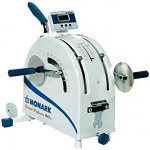 Our safe and gentle equipment selections are ideal for toning leg and arm muscles, and our expert staff can help you get the right equipment at affordable prices. Be the best you can be by choosing Sportaid as your Exercise Equipment supplier. Whether you are a new customer or someone who has been shopping here for a long time, we guarantee satisfaction. After over 25 years in the business helping people find Disability Exercisers & Peddlers at the lowest prices, we continue to lead the industry! We carry a large selection of wheelchair cushions, wheelchair parts, and wheelchair accessories. We are capable of beating any competitor's advertised price, just call! Our customer service staff has over 50 years of experience, plus over 90 years of combined wheelchair use experience. We look forward to working with you!